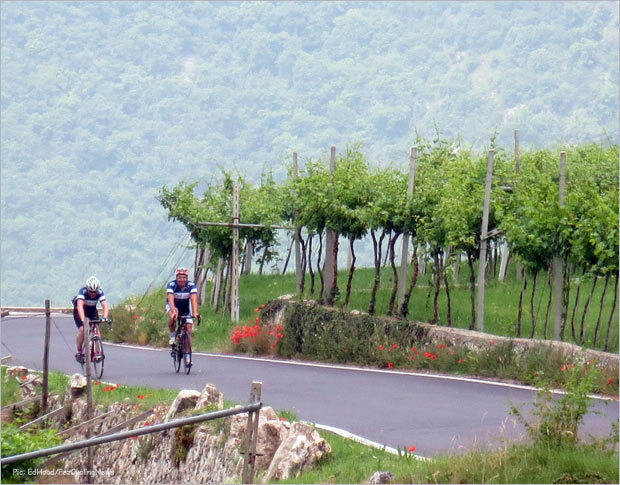 Most PEZ Readers know a bit about the 'bike hotel' concept, and many of you have enjoyed the benefits of staying in one location, and hospitality by gracious hosts who know the best local rides, food - and wine, all in a cycling dreamland like Italy. 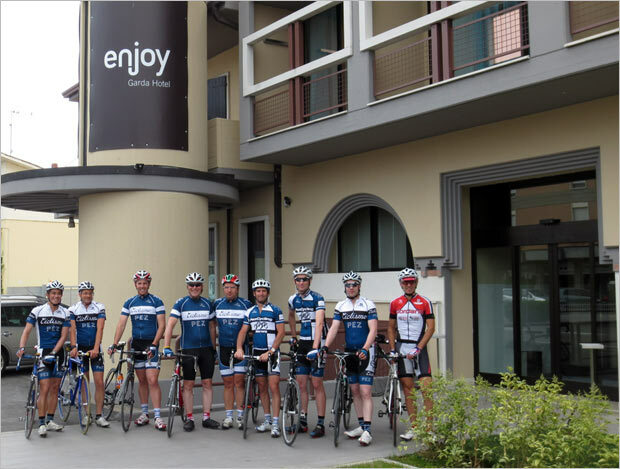 The Garda Bike Hotel was one of the first to cater to road cyclists, and with over ten years experience, it's no wonder they've become THE place to stay at Lake Garda. I've now stayed with Nicola & Alberto more times than I can remember, but one of my favorites was part of our PEZ 10th Anniversary celebration – when the PEZ-Crew & I spent a week riding our bikes in Italy – and a few unforgettable days on Lago di Garda at the Garda Bike Hotel. It’s a bike hotel in the very best ways, and one you should know if you’re planning to visit the area. By now you’ve read mention of, and hopefully seen the stories I’ve posted about Italian bike hotels here on PEZ. 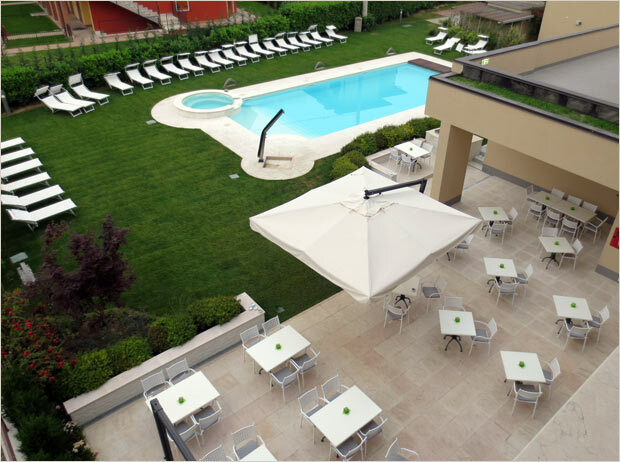 As hotels designed for and dedicated to cyclists, they’re a far cry from what we’re used to in North America, but like heaven on earth when it comes to delivering what discerning cyclists need for a riding holiday in Italy. Here’s the largest recorded sighting of PEZ-Crew gathering in one place – heading out for a ride from the Enjoy Garda Hotel. I introduced PEZ-Fans to the Garda Bike Hotels here a couple months back, and since then I’ve been lucky enough to visit them myself. 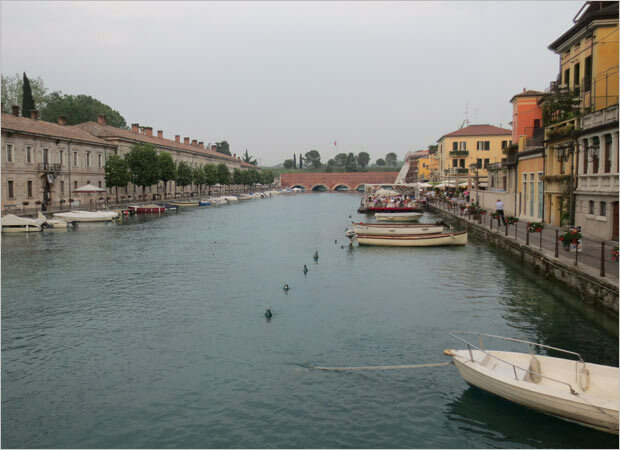 For the second half of our week-long 10th Anniversary PEZ-a-thon, we booked into the Enjoy Garda Hotel in Peschiera on the southwest corner of Lago di Garda on the border of the Lombardia and Veneto regions. 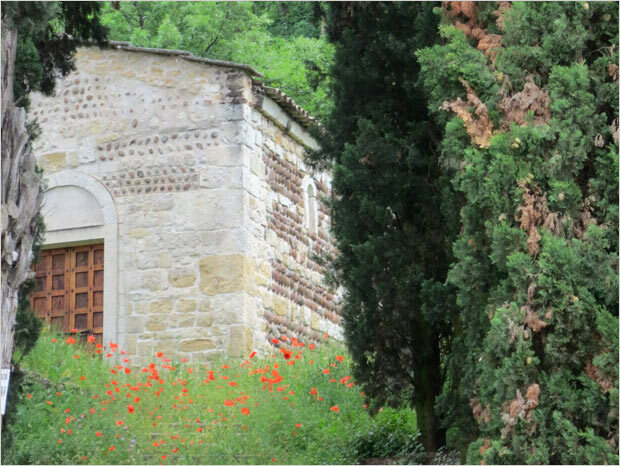 It’s an easy 90 minute drive from Milan, even closer to Verona, or Bergamo (for those of you flying in.) The lake itself is reason enough to visit, and is popular with toursists from across Europe, and is also home to the oft-called ‘cheesy’ Gardaland amusement park. Peschiera del Garda dates from Roman times, and boasts an impressive fortress that was a key part of Austrian military defences in the 19th century. 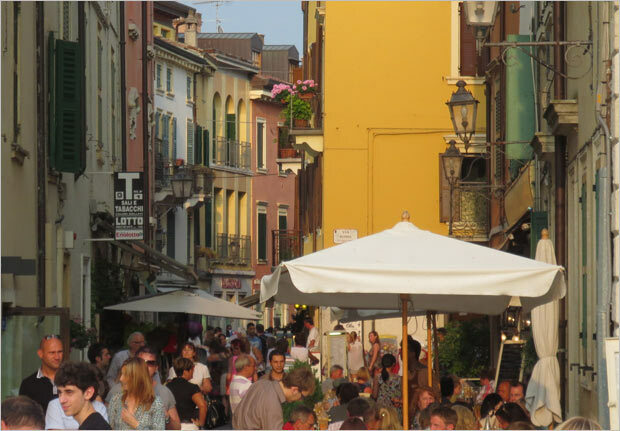 The hotel is a 10 minute walk from the lively old town - a bustling Italian classic in every sense of the ‘tiny streets, small piazzas, cool cafes, and stylishly dressed Italiani’ stereotype. Our package included 3 nights in Bormio at the Hotel Funivia, and the transfer (after an epic ride over the Passo Stelvio) from Sluderno to Peschiera, where we’d booked in 4 nights. Our three days of riding in the Garda region culminated in tackling the the medio corsa (85km) of the Granfondo Damiano Cunego on the Sunday. 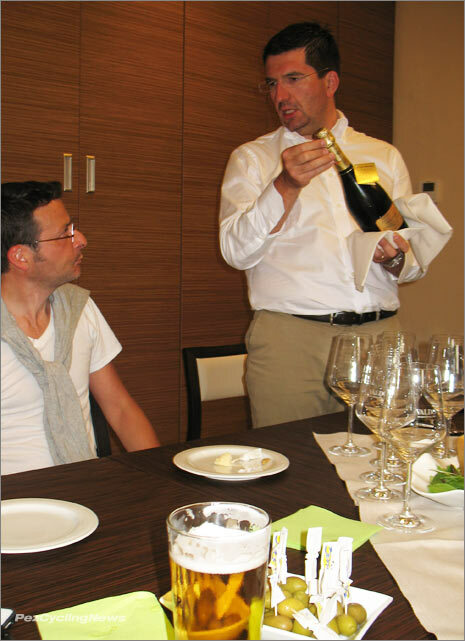 We were pretty much spoiled rotten by our stay at the Hotel Funivia, and although I had every confidence that Nicola Verdolin (manager of the Garda Bike Hotels’ two properties - Veronello & Enjoy) would deliver on the riding experience he promised, the bar had been set pretty high. I also have travelled in Italy enough over the past 25 years to know that things don’t always go as planned. General manager Nico Verdolin pulls double duty as a ride guide, and triple duty as barrista, serving up espressos at the bar. 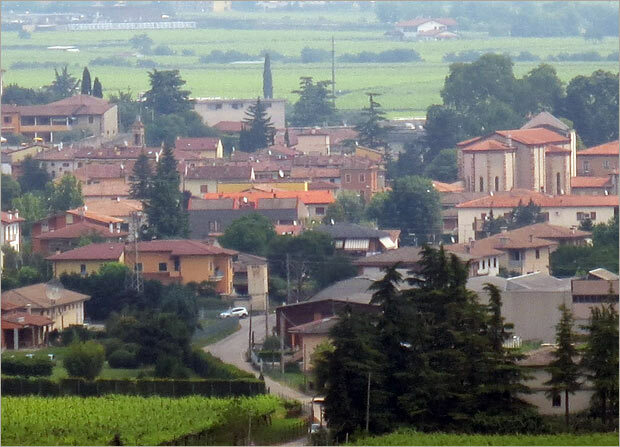 I say this not to cast doubt on any Italian travel plan, but to emphasize how well our expectations were met – even under some unusual circumstances. 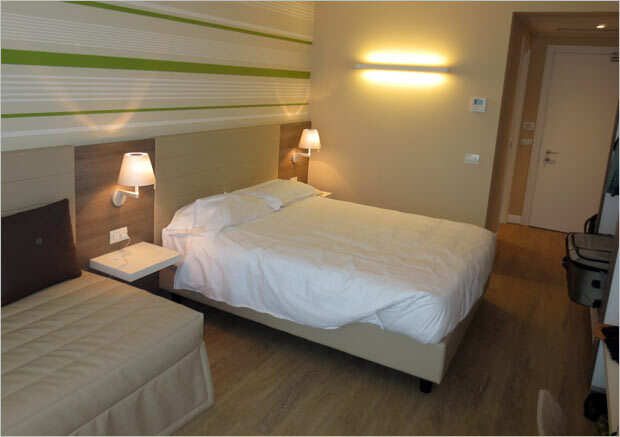 We were among the very first guests to stay at the just opened completely renovated Enjoy Garda Hotel – in fact Les was mistakenly assigned an unfinished room - there were no bed or fixtures. Construction crews were still on site putting finishing touches in place, and while there was still some dust and noise, the property itself – rooms, pool area, bar, dining & meeting rooms, and of course lobby – were all shining and welcoming – as were the dedicated staff. The design is modern, sleek, and hip, a big step forward from so many of the old fashioned ‘alberghi’ I’ve seen over the years – and I don’t mind saying I’ve reached a point in life where I prefer a level on modernity that adds to my limited time to relax. Case in point – the no-charge wireless internet was fast enough that I could Skype with my girls back home. But some aspects of accommodation are best done the old fashioned way, and it bears noting that like the best hotels I’ve found, this too is family run. Nicola is the general manager, and part time ride guide, his brother Alberto runs the daily operations, while their father & capo Lorenzo kept us entertained pouring cocktails at the bar – until he had to leave to make it home in time for dinner. 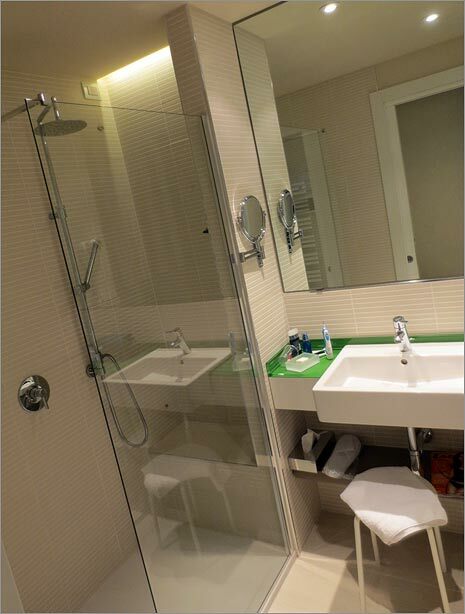 There’s plenty of onsite parking (unlike a lot of hotels in Italy), an electronically secured bike storage room, and the much appreciated daily laundry service for your bike kit. We could write an entire ‘Top Rides’ book just for this area alone – and we didn’t even get out of south east Garda… Again – I know it’s Italy and the roads are endless, but this region does offer up an impressive mix of flat, rollers, hills of all sizes and even a couple of small mountains to climb. On a clear day the lakeside riding is nothing short of spectacular, even if there are more cars along here than I like. But like most urban-style riding, you need to ride through a few arterial roads to get to the good stuff – which for us was never more tan a 20 minute warm-up away. 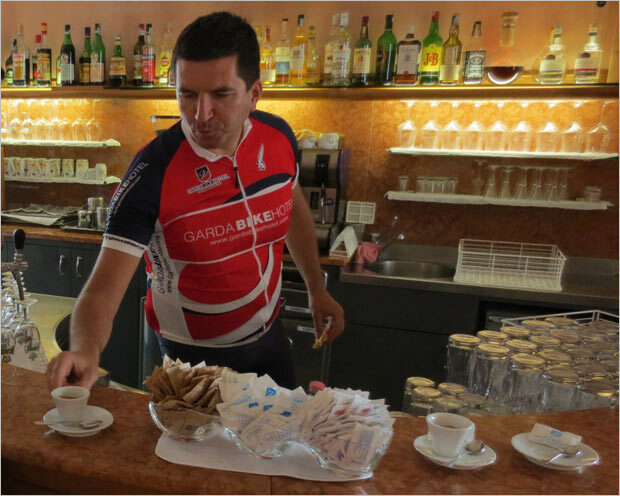 The hotel provided a dedicated guide – ours was the fit-issimo Marco – who’s ‘real’ job is in a local bank, but based on his 4th place in his category in the Granfondo Damiano Cunego, his heart and legs belong to the bike. He was always there covering the back of our group of 7, and eager to take in extra miles when Nicola offered us a bonus climb along the way. And while Nicola spends many hours each day on the hotels business, he rode with us for two 5-6 hour days and completely looked after us getting to and from the gran fondo. 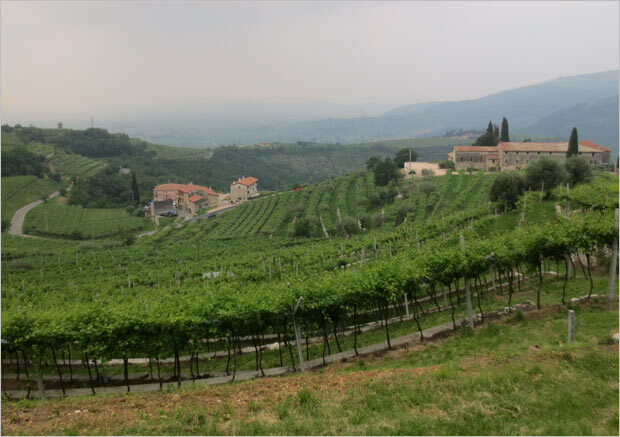 He took us on a fantastic 5 hour jaunt one day that took in the hills of the valpolicella vineyards in the area, stopped by one of his favorite enotecas for lunch, then carried on to Verona for a cafй in the main piazza – cylcotourism at its finest. The pace was always relaxed – determined by the group, start times were mutually agreed upon, and it really was geared to what we, as guests, wanted to do. 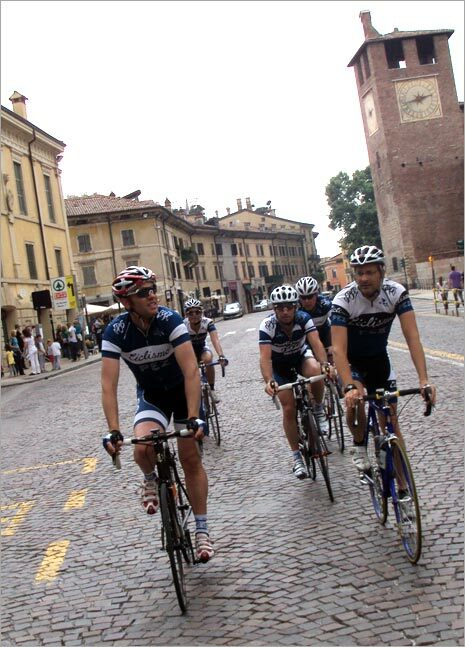 The Crew prepares to take a caffe in Verona. There was always time for a refreshment stop on the rides. Waking up here is knowing you’ll have at least three fantastic meals before your day is over. I know it’s Italy, and everyone always says how awesome the food is, but I’ve personally eaten a LOT of meals in that country, and feel compelled to emphasize just how good the kitchen is at Enjoy Garda. Our days started with a full breakfast from their extensive freshly prepared buffet – all of my favorites were there – fresh baked croissants filled with chocolate, marmalade, or the tasty original ‘plain’ style, a selection of freshly cut fruits, cold cereals, yogurt, both fried and scambled eggs, a whole table devoted to cheeses, fresh baked breads and a toaster that actually toasted, of course the modern equivalent of your local barista – the ‘fully automated push a button and get it any way you want it’ espresso machine. All you need to know is there was more than enough to fuel up for several hours of riding ahead. We’d always stop for coffee and something to eat while riding, but we also enjoyed the cold pasta buffet waiting for us when we returned and needed some more to tide us over till dinner. I know my photos don’t do justice to how good the dishes looked in real life – but I can assure you all us were very pleased with the food. And dinners were the best part. The dining room works like a restaurant (well, duh…) , you can make a reservation or just show up for a table. 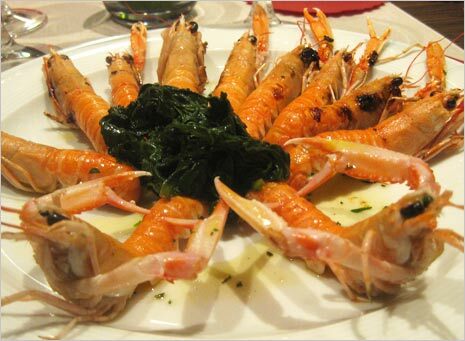 The menu changes each day, but offers only a few choices for antipasti, primi, secondi, contorni and dolce. I’d describe the meals as fine dining – and am not stretching the truth. The wine list is extensive enough for most tastes, but as we’re smack-dab in the middle of the valpolicella grape growing region, there was really only one type of wine for me – I drink a lot of valpolicella at home and was treated to some fantastic new bottles, all confidently suggested by our server. However - the defining moment of our dining experience for me was the risotto. 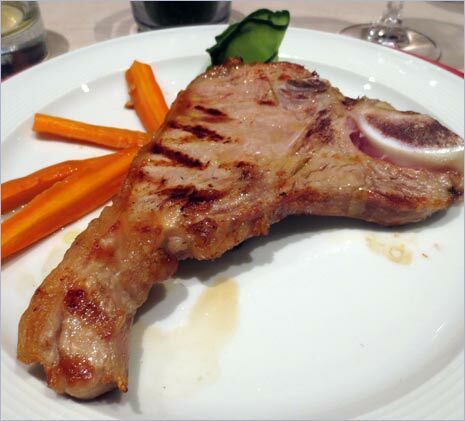 I’m a huge fan and will order it over pasta any day of the week in Italy – no where is it cooked to such succulent perfection. 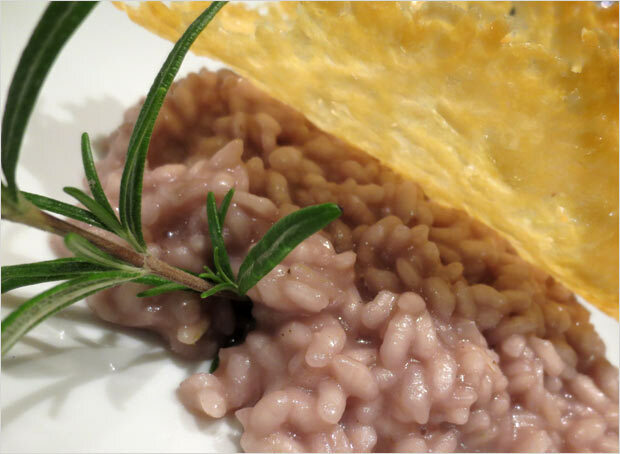 Back to my story – on one of our rides through the area, we stopped for lunch at an enotecca that Nicola knows (although his directions has riding our bikes ‘cross style through a vineyard to get there…), and they offered a “amarone risotto” on the menu. Seldo and I opted for the fantastic lasagna instead, but after asking Nicola about the rice dish, I overheard him talking about it on his cell phone. 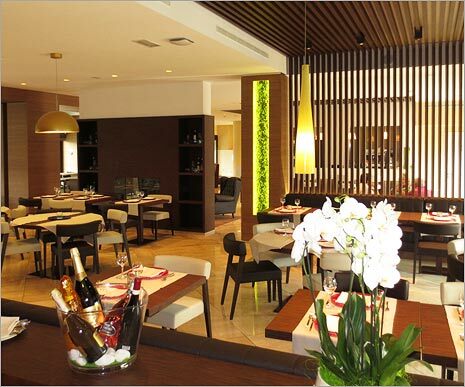 At that night’s dinner back at the hotel, we were treated to piping hot plates of freshly made amarone risotto – which was not on the menu. It was served with a sprig of freshly cut rosemary, and topped with a lightly fried parmesan wafer. We all agreed it was absolutely fantastic. But Enough From Me – What Do The Guys Think? 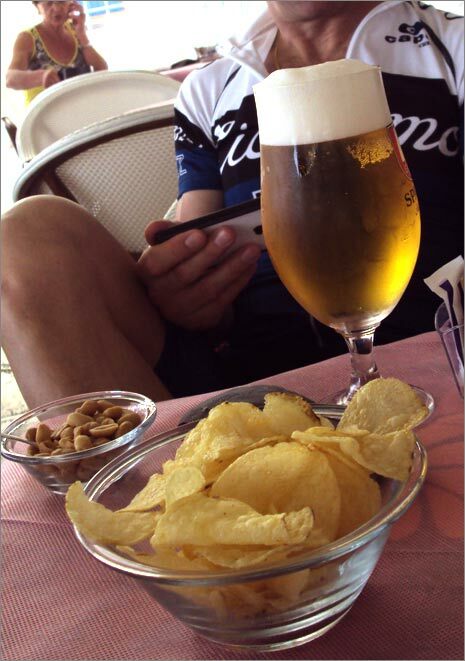 For someone who's ridden and raced over much of Europe I'd never had the pleasure of going to Garda so it was a new experience for me and one that I am keen to relive. In rating a region and its hotel I generally base my feelings on 4 very selfish things, food quality, riding experiences on offer, hotel comfort and bike security. 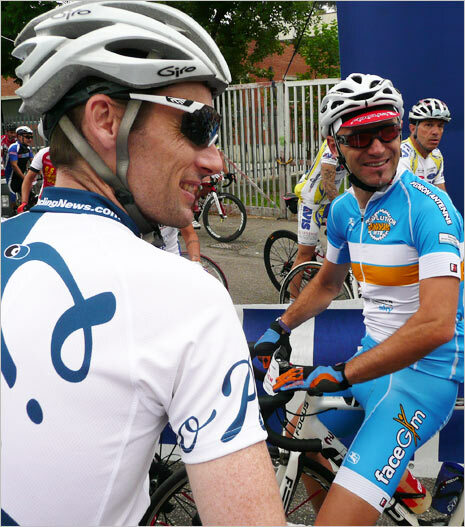 Chris and our guide Marco talk strategy at the Granfondo Damiano Cunego startline. After arriving late on Friday after a long drive from France I met the guys who were relaxing poolside, eating a superb post ride meal and talking about how good the ride was. I thought that things were looking pretty good. I mentally ticked the comfort and food boxes - now it was time to get the bike out of the car and put it in the bike room. Certain hotels where I've stayed in the past the 'bike room' has been a closet, an unlocked shed outside or even worse so to find a dedicated, secure bike room that required an electronic key to open was another pleasant surprise. Nicola cracks into a perfectly chilled bottle of prossecco to kick off our pre-granfondo team meeting. My first ride around Garda the next day was a pleasant experience enjoying the many beautiful sites, but the true highlight for me was the night before our famous Damiano Cunego Gran Fondo experience when Hotel owner Nicola pulled out all the stops for our team meeting and dinner. I've attended pro team meetings before, had my own team meetings in the amateurs which were generally on the ground somewhere around an energy bar or two but never, never have I had a team meeting around prosecco, grana padano and assorted snacks with the race's profile explained to us on a big screen tv. Class. I left a bit of my heart at the Enjoy Garda Hotel. Unfortunately, I'd also left bits of my elbow and hip a few miles further up the road. By now, you'll have seen the PeloPic of Mr Cheapo sorting out my wounds ... what happened next was what defines a passion for helping people as opposed to simply running a hotel. Nicola was along leading the ride that I failed to finish. As I stood staring at my bleeding elbow with a mix of embarrassment, disbelief and frustration, Corey was out with the electrical tape and Nicola was on the phone making arrangements. I bailed out, with Marco the guide leading me back towards the Enjoy's sister ship at Veronello. I just looked across at him: "Sorry, Marco ... I hope the bike is OK."
A gentle arm across the shoulder as we rolled sedately towards the pick-up point: "Frame of the bike is not important ... frame of you is important." Marco shared the story of how he came to have a lot of titanium in his hip, making me feel better. Nicola's genial papa Lorenzo arrived with the van to transport me back to the Enjoy Garda - we shared a bonding session about that other Italian passion, the squadra azzuri, the nation's soccer team. Heading for the Euro 2012 championship, we talked about the manager Prandelli, the wayward striker Balotelli, the aging Pirlo, the calcioscommesse scandal. 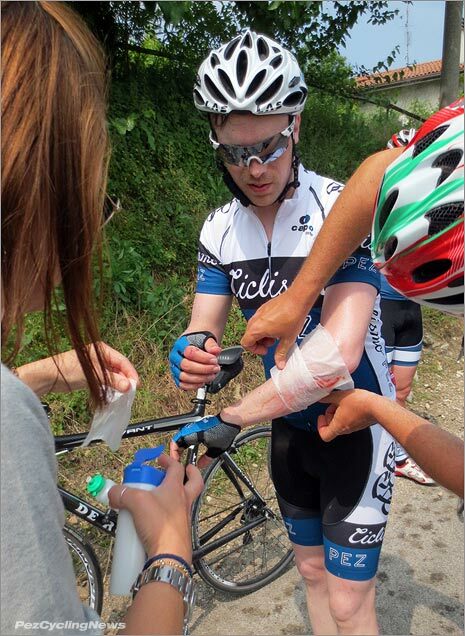 The Enjoy Garda team had done their best to make me feel better, Marco and Lorenzo, literally, going far out of their way to help fix me. It's still appreciated. Molto grazie, gentlemen. 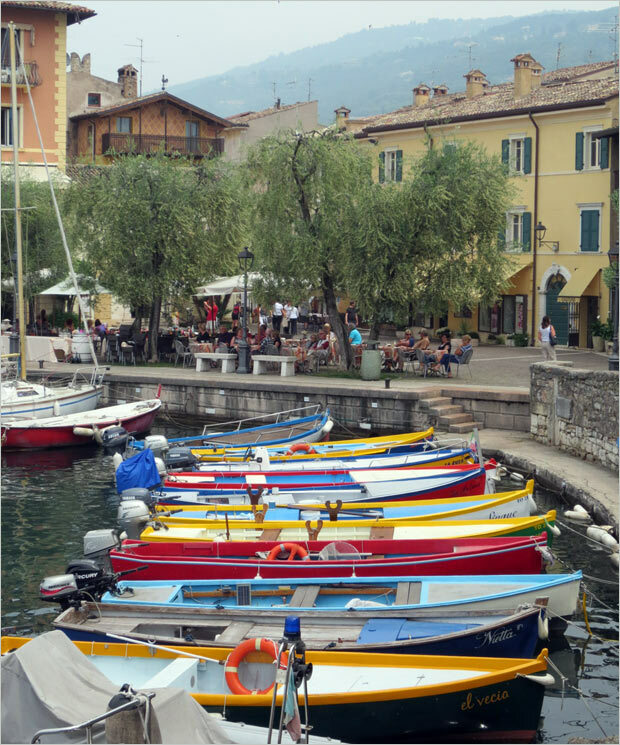 Coming from the quiet and peace of summertime in Bormio, it was a bit of a shock to the system arriving to the summer tourism and busy-ness of Lake Garda. Therefore, I'll admit I had some hesitations about the quality of the riding in the area. 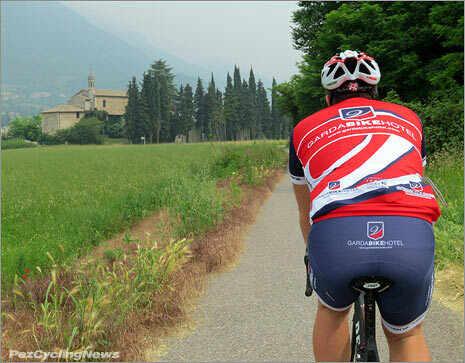 Thankfully, first impressions can be deceiving, and we were treated to three days of beautiful cycling. The terrain was what I'd draw up myself if I were to plot out a great cycling holiday and weren't focused on all day climbfest - lots of quiet roads on varied terrain. We did some terrific riding up 3-6 km climbs snaking through vineyards as far as the eyes could see, then snaked down the descents keeping one eye on the road and the other on the beauty of Lake Garda below. Nicola insisted on calling me Rodriguez, and repeatedly pointed our guide Marco to take me up extra climbs while he led the gang onwards towards flatter terrain with the promise of gelato - he managed to coerce Leslie for about 35 km with that promise before finally settling on the perfect gelateria! Corey once again proved his practicality and frugality, choosing the comfy & light, (and also dispensible) complimentary slippers from his room for the ride in the van to & from the granfondo. Though I often write about being CheapOh, it is not my intention to promote cheapness. Being cheap is another beast and it implies sacrificing quality to save a few bucks. It also implies forgoing certain experiences merely based on cost alone. Instead, being CheapOh is synonymous with frugality and sensibility. 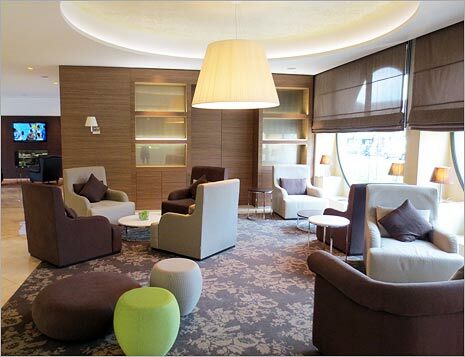 If the products we use and the services that we choose are of a justifiable or lasting quality, then that’s also CheapOh. Nicola was a welcome engine to have on the front after 4 hours of riding. Which brings me to the Enjoy Garda Hotel and PEZ Get Together. I wouldn’t have missed it for the world. It just so happens that Peschiera is about an hour and a half from home. By far, my voyage was the shortest and cheapest (beat Matt by a good hour). Now we could have roughed it a bit more, lived with less luxury, gotten lost without guides and have to deal with all of the logistics of group travel ourselves, but it would not have made sense to waste such short and precious time. Sometimes it is better to let professionals handle things. And the folks at Enjoy Garda Hotel did everything right – including Nicola pulling the whole crew the last 30 kilometers home at 38km/h with strong headwinds (that’s good CheapOh). - If you haven’t figured it out by now – we had an excellent stay here. I for one rank it high on my list of places to see again, and I’d love to take Mrs. Pez along too. She’s not really a rider, but there’s plenty to explore in the area to enjoy a few days as part of a longer trip. It’s also perfectly suited to a whole week of riding.